"Bacon wrapped green beans sprinkled with a little brown sugar, salt and pepper and popped in the oven turn plain green beans into something guest will love and kids can't help but gobble up." Preheat oven to 350 degrees F (175 degrees C). Grease a casserole dish. Set out the bacon, green beans and casserole dish in a little assembly line. Lay out a half strip of bacon. 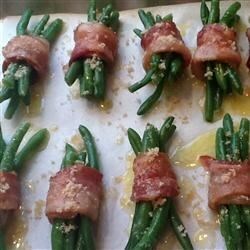 place a small bunch of green beans (6 or 7) onto the strip of bacon and roll up into a bundle. Place the bundle into the casserole dish, seam side down. Repeat with remaining bacon strips and green beans. You can pack these pretty tight in the pan, just know that if the bacon is touching another bundle they take some prying to get apart. Sprinkle with the brown sugar and salt and pepper. Bake in the preheated oven until browned and heated through, about 20 minutes. My daughter makes these for me every holiday as an alternative to green bean casserole. That is good too but I prefer Bacon Wrapped Green Beans. She adds just a touch of garlic and onion powder. My sister makes these for Christmas each year, BIG favorite! She uses whole fresh green beans...even the kids eat these! Love them! Next time I am going to use more brown sugar and butter. I did use a splash of soy sauce and garlic powder like someone suggested! I used precooked bacon, blanched the green beans, and baked them for a shorter time. They were wonderful. My guests raved about them! I will definitely make them again.